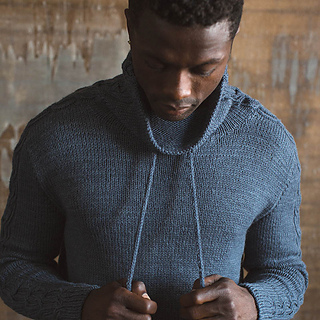 The Nelson Pullover is a modern knitter’s take on men’s athletic wear. 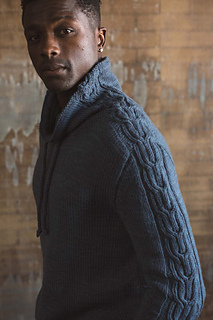 This sporty, youthful pullover features a continuous cable that runs up the sleeve and shoulder into the cowl neck. 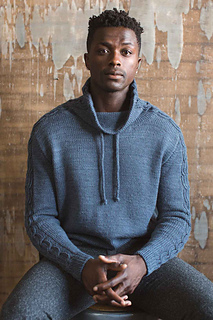 The drawstring ties add charm as well as warmth in cold weather. Finished Size 36.5 (40, 44.5, 48, 52.5)“ chest circumference. 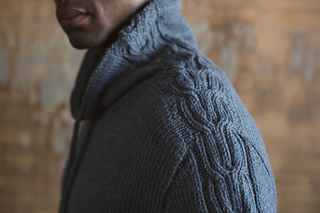 Pullover shown measures 44.5”; modeled with 6” of positive ease. Yarn Brown Sheep Company Nature Spun Worsted (100% wool): 133W blue fog, 5 (6, 6, 7, 8) balls. (4.5 mm): 16” and 32’’ cir and set of dpn. Adjust needle size if necessary to obtain the correct gauge. Notions Markers; cable needle; stitch holders; waste yarn; tapestry needle. Gauge 18 sts and 26 rows = 4” in St st on larger needle; 20 sts of Sleeve chart = 3” wide on larger needle. 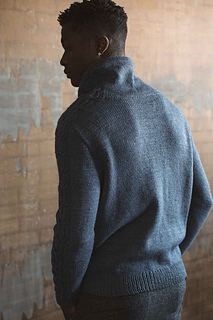 Notes This pullover is worked from the top down. The saddle shoulders are worked back and forth, then stitches for the back and fronts are picked up along the edges of the saddles and worked back and forth to the underarm. The pieces are then joined and the lower body is worked in the round to the lower edge.